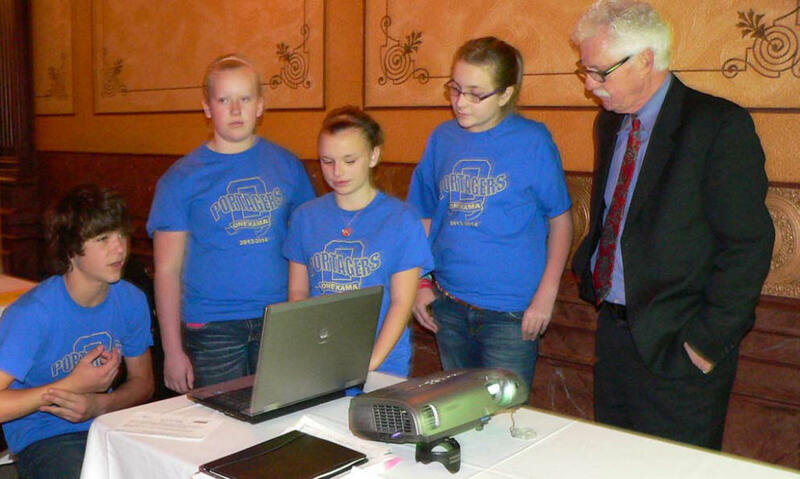 ONEKAMA � No one could blame Onekama Consolidated School officials if they were beaming with pride after the presentation four of the district�s students made at the AT&T/Michigan Association for Computer Users in Learning (MACUL) Student Showcase in Lansing. Students Jacob Mauntler, Mackenzie Bradford, Carlee Pepera and Katelynn Feil were selected to represent the school at the 13th annual showcase that was held at the state Capitol last week. 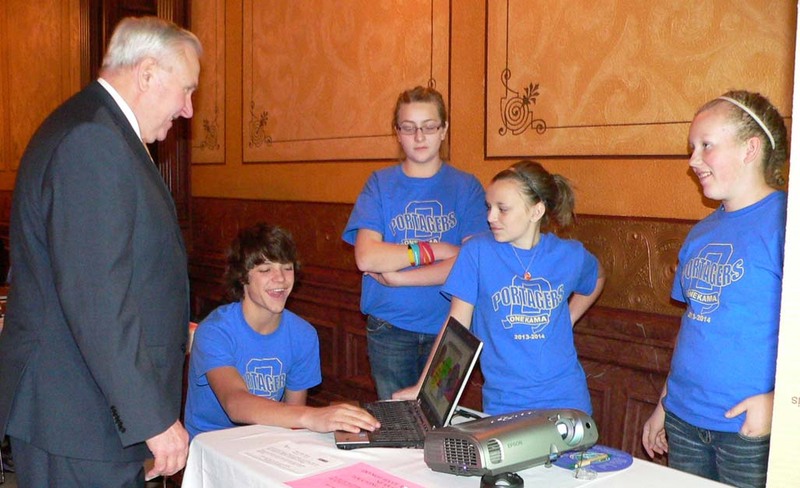 The showcase is designed to show legislators and interested citizens how technology is being utilized in the classroom. Onekama Consolidated Schools was one of 35 schools to present during the showcase. It is sponsored by the Michigan Department of Education and MACUL with the purpose of bringing levels together to share their knowledge and concerns regarding educational use of computers and technology. Neph said the four students proved to be good ambassadors for Onekama schools at the conference. Also attending with the students were parents Kris Mauntler and Peggy Pepera. Students said they felt the trip was very worthwhile, and they learned a lot. Mauntler said meeting the legislators was an exciting part of the trip, as was the opportunity to see where legislation is created in the Capitol. 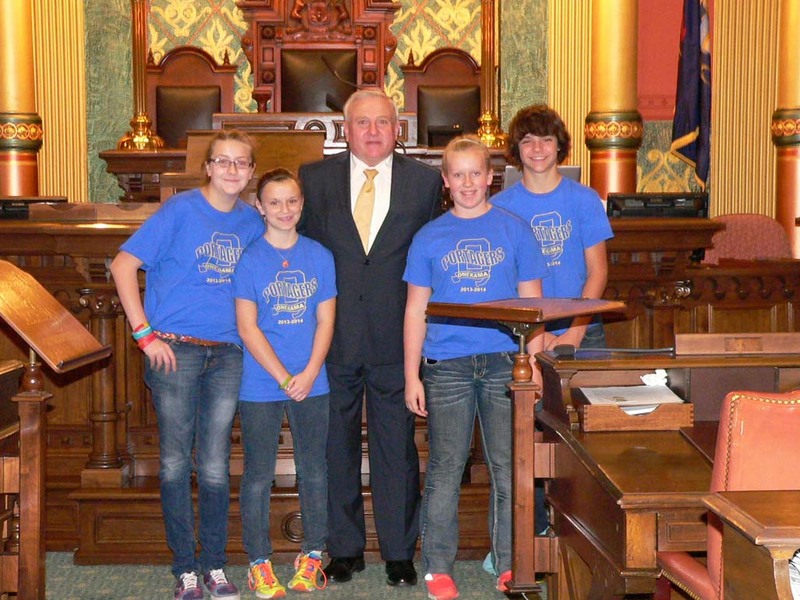 Onekama students meet with State Rep. Ray Franz on the floor of the House of Representatives. Students were in Lansing for the AT&T Showcase as presenters. Students shown (left to right) are Katelynn Feil, Carlee Pepera, Mackenzie Bradford and Jacob Mauntler. Feil said she enjoyed the trip and all the things they saw in Lansing. She pointed out that many schools are doing similar things with iPads like they are at the Onekama schools. All the students felt it would be interesting to return to the showcase in a few years to learn how much technology in education has changed since they attended the showcase. The added realization of how much it has changed since they began attending school was made more apparent by what was shown at the showcase.